Stepper Motor chip generates control signals that can be used with for both Unipolar & Bipolar Stepper Motors with appropriate drivers like the L298 & L293. · General / Hobby Purpose Stepper Motor Controller. · Compatible with 4 Phase Unipolar / 2 Phase Bipolar Motors. · Master / Slave mode - Standalone Free Running Mode. · 8 RPM Selections in Free Running Mode. · Compatible w/ Drivers - L298, L293, Discrete Transistors. · Half / Full Wave: Step Modes, Direction Control, Enable. This kit allows one to control a uni-polar stepper motor from Windows (comes with 12 volt Stepper Motor). The exclusive Windows interface is designed to teach fundamental stepper motor control. Automatic & manual control of the stepper motor is available through the Windows interface. Windows controls available are speed, direction full step, half step, and manual step. The controller is capable of operating motors from 5 Volts to 24 volts. 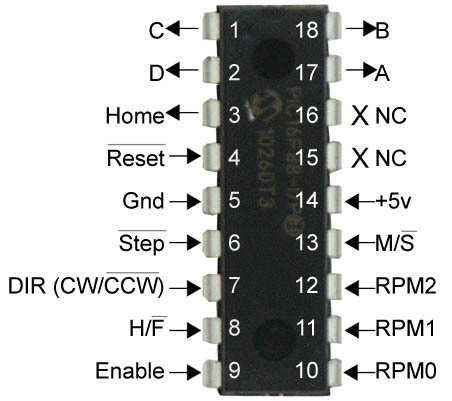 The stepper motor controller kit allows one to control a uni-polar stepper motor. The intuitive switch interface is designed to teach fundamental stepper motor control. Manual control of the stepper motor is available through the interface. 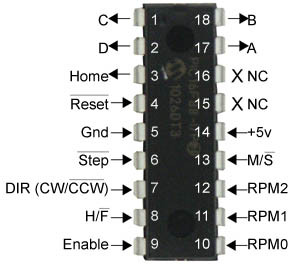 The stepper motor controller kit allows one to control a bi-polar stepper motor. The intuitive switch interface is designed to teach fundamental stepper motor control. Manual control of the stepper motor is available through the interface. Fuji Electrochemical Co. P/N ST-04 is a unipolar 7.5 deg/step motor (six wires). Features include 50/100 s/rev, 12 V, 70 Ohm coil. These new motors are 1.65" (42mm) in diameter by 0.57" (14.5mm) thick. The shaft is 0.12" (3mm) in diameter by 0.39" (10mm) long. It has a 1.65" (42mm) square mounting bracket with 4 .01" (3.5mm) holes 1.38" (35mm) apart. There are six approximately 19" long leads wires that come out of this motor from two side by side holes, one hole has three wires, a red, a brown, and a black wire, and the other has 3 wires, a red, an orange, and a yellow. © 2010 Images SI, Inc.